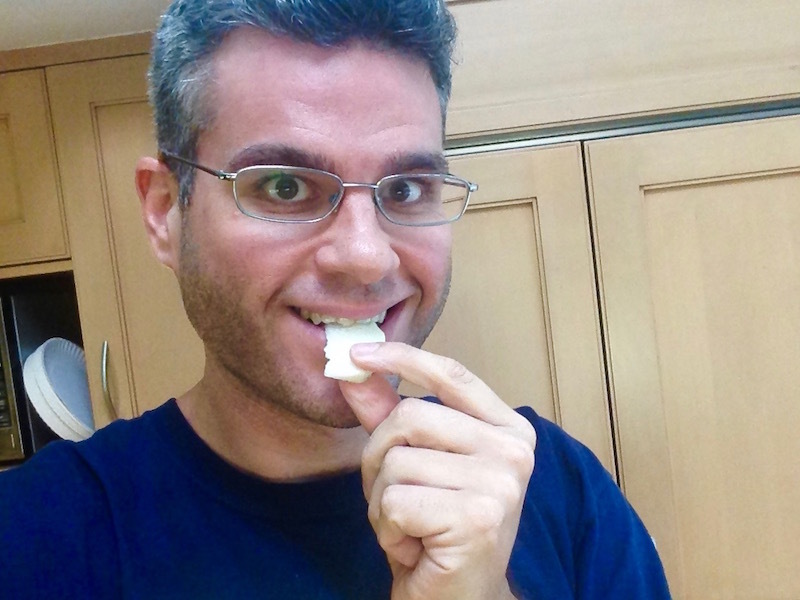 I Learned All About Kohlrabi and Then Cooked It Three Ways | Keep It Up, David! Kohlrabi is a vegetable, related to cabbage, broccoli, and kale. The name is German in origin, loosely translated as ‘cabbage turnip’, and that’s fitting, because it looks like a cross between the two. It’s popular in Germany, and German-speaking countries, as well as parts of Vietnam. RELATED CONTENT: Read More Posts About Obscure Fruits and Veggies Here! The bulb is the main edible part, and often you only see the bulbs at the store. 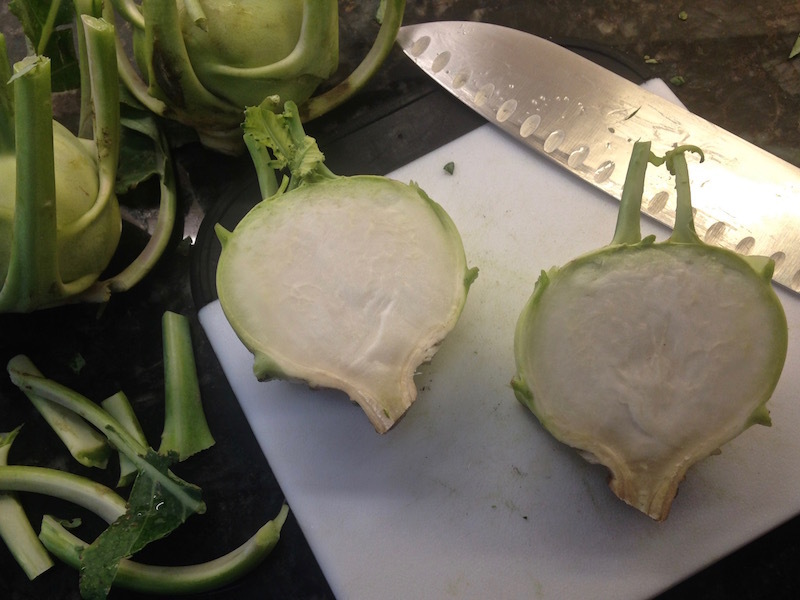 These kohlrabi came with the leaves, too, and those can be eaten as well, if they’re cooked. 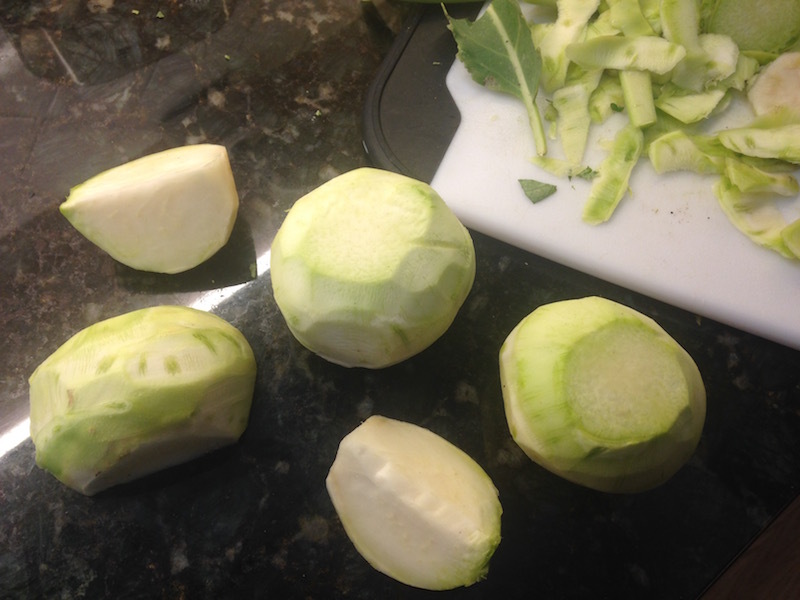 The inside of a kohlrabi looks like a turnip, and has the same texture and feel. The outermost green layer is thick and fibrous, and it can be removed with a vegetable peeler and some elbow grease. I read that kohlrabi can be eaten raw, so that’s how I tried it first. While it has the texture of consistency of a turnip, it’s taste is similar to broccoli trunks, although perhaps a touch sweeter and milder. It had a nice snap, like jicama. Kohlrabi is very low in calories: a half-cup has around 25 calories. It has a surprisingly high amount of vitamin C – that same half cup will get you 70% of your daily requirement. Like turnips or parsnips, it’s a good low-cal, low-carb alternative to potatoes. 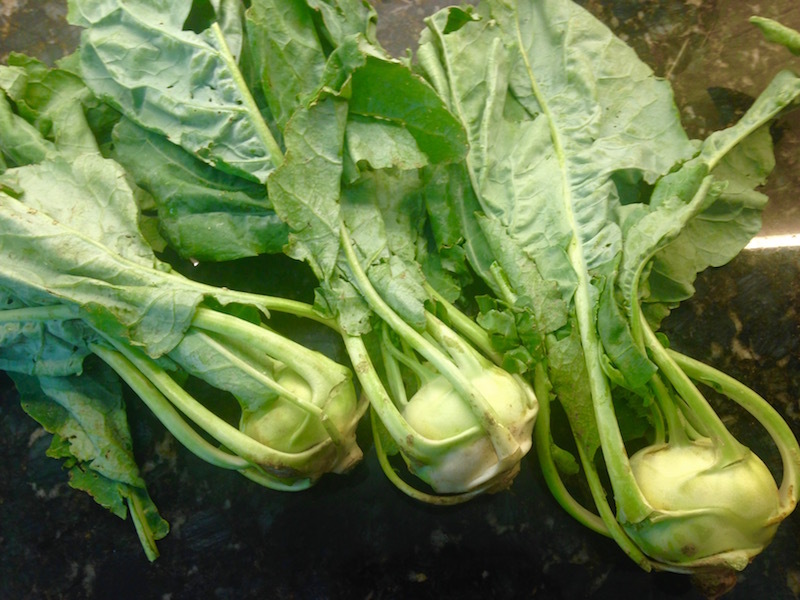 So I had three peeled kohlrabi bulbs and a pile of greens… what was I gonna do with them? 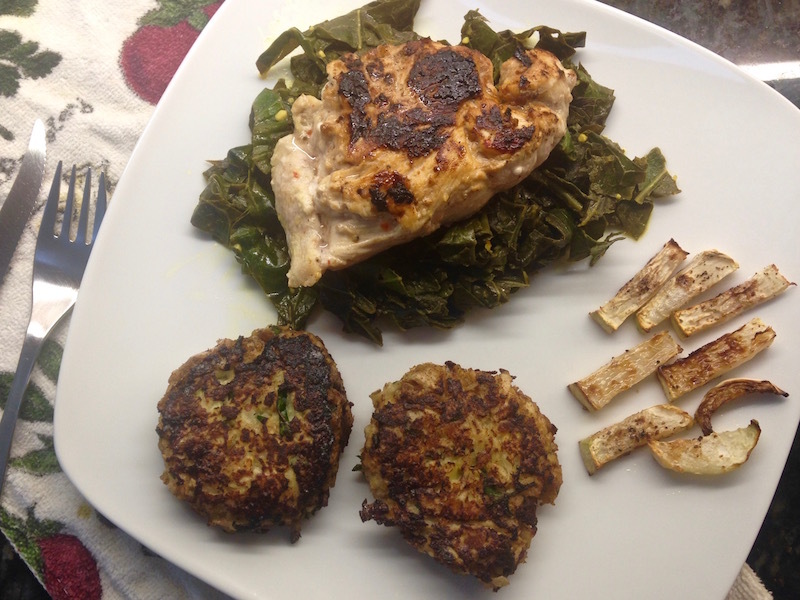 I wanted to get a full kohlrabi experience, so I cooked it three ways! 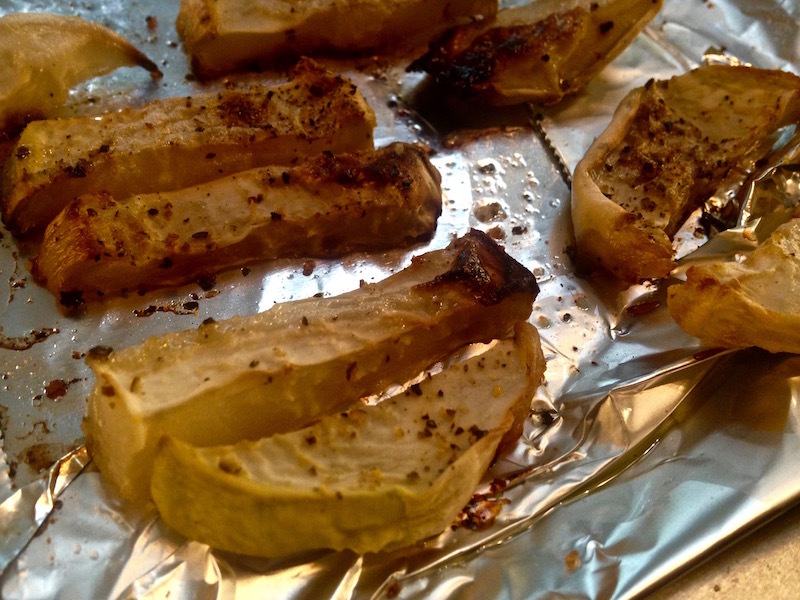 Most vegetables are good roasted, so it was a no-brainer to try to roast kohlrabi. 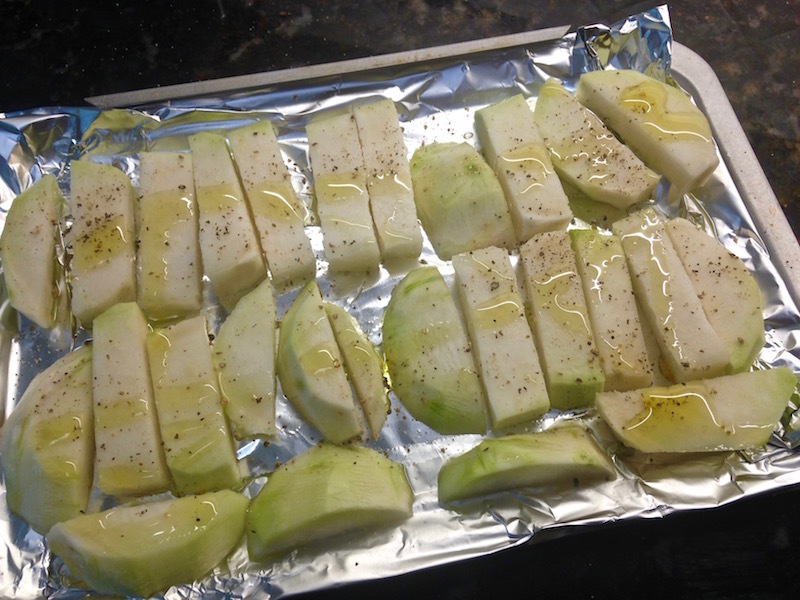 I cut one kohlrabi bulb into pieces and sprinkled them with salt, pepper, and 1 tablespoon olive oil. They went into the oven (toaster oven, actually) for about 40 minutes at 400 degrees, and during that time they shriveled up and got some color. Since the leaves are edible, I wanted to eat the leaves! I presumed the thick ribs wouldn’t taste too good, so I cut them out, like you would with kale. 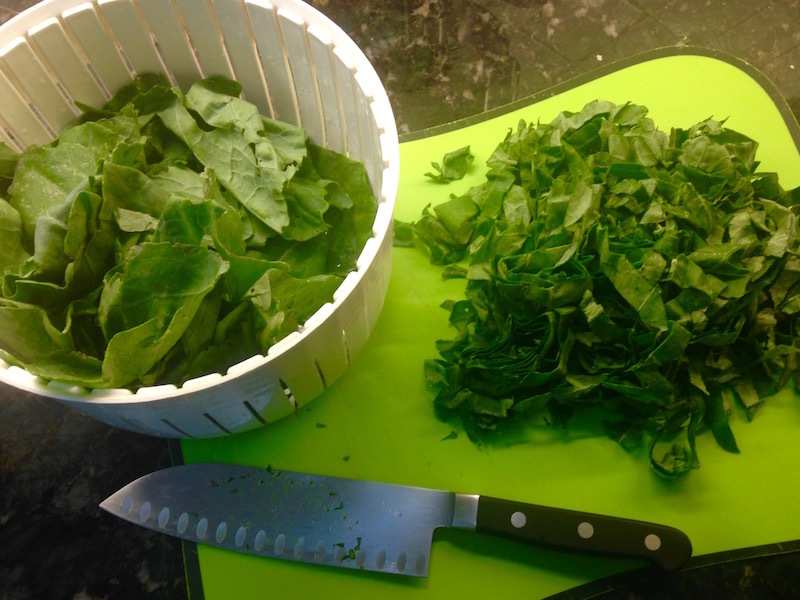 After rinsing the leaves and giving them a whirl in the salad spinner, I chopped them in thin-ish ribbons. 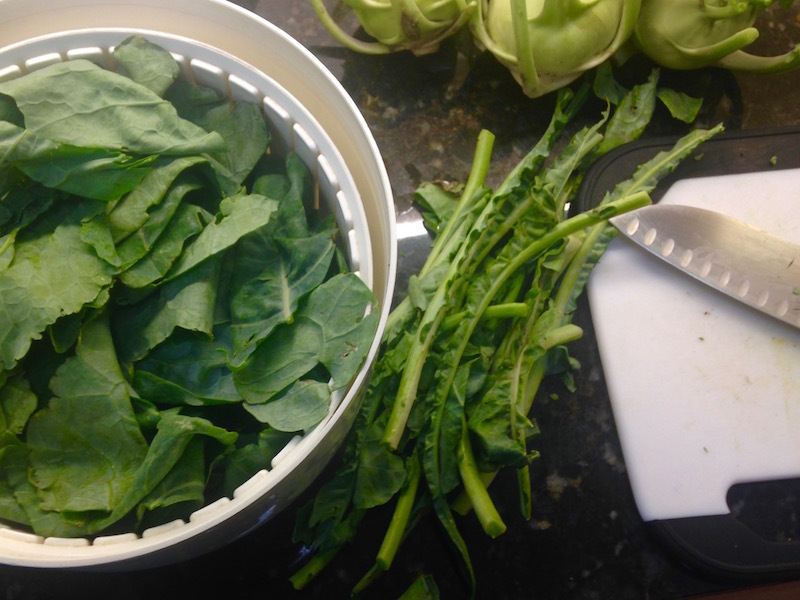 I ended up with about 12 ounces of greens. After 10-15 minutes, I tried it, and it was a little bitter. So I sweetened the dish by adding 1.5 tablespoons or orange marmalade. Saving the best for last! And no, these are’tn dessert cakes. 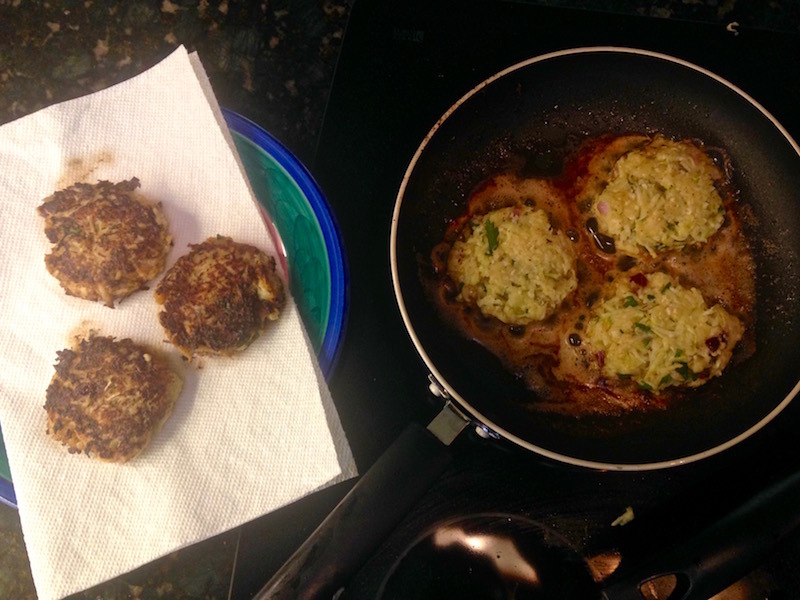 They’re veggie patties, like potato pancakes. And like potato pancakes, it starts with a lot of grating. 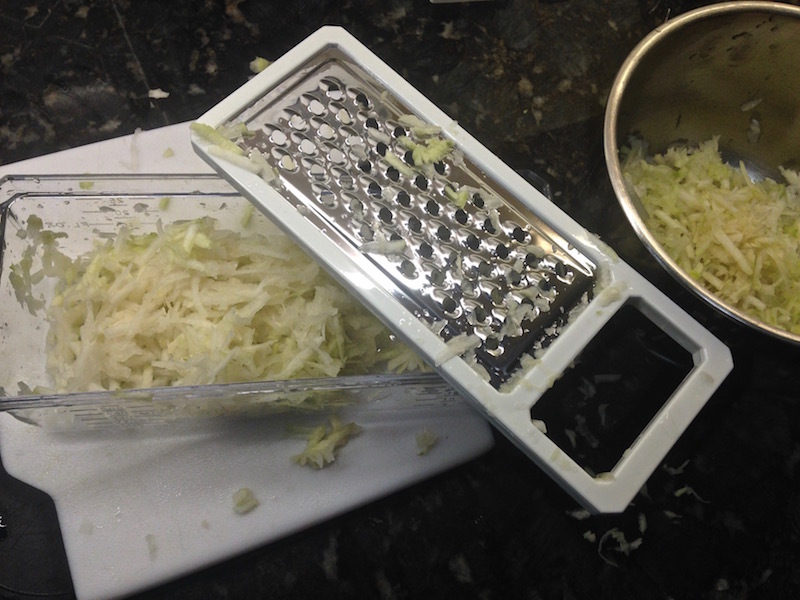 I grated two kohlrabi bulbs. 1 tablespoon each fresh parsley and basil, minced. Mix it all together, and using your hands, shape the mixture into 6 balls, like you would meatballs. Melt 3 tablespoons butter in a skillet, and when it’s melted, add three of the balls. 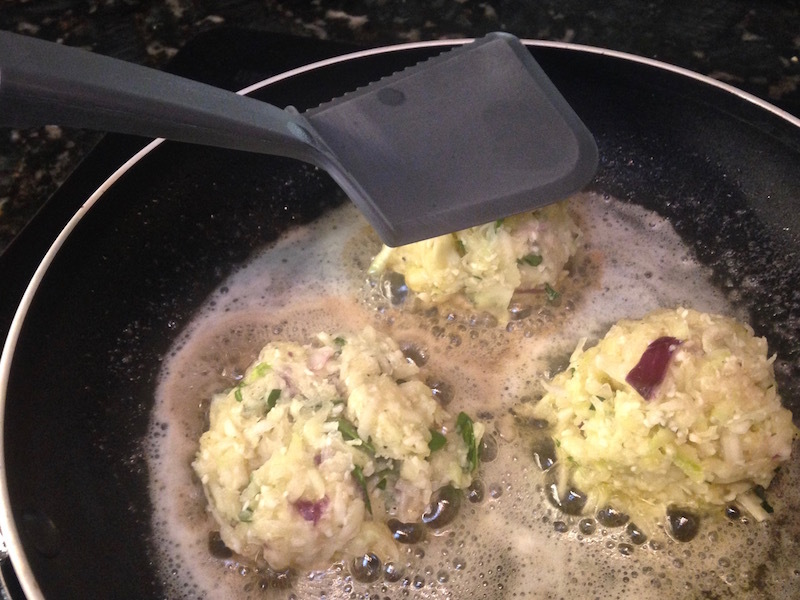 Use the back of a spatula to gently flatten them into patties. They need about 3 minutes on each side, and then they can be transferred to a paper-towel-lined plate, where the excess butter can drain. I added one more tablespoon butter before frying the other three, just because the first three soaked up a lot of the butter. Don’t these look amazing? Guess what! They are! They had a nice crust, but soft in the center, and the herbs, onion and cheese added lots of depth of flavor. Filling, healthy, and a nice representation of the versatility of kohlrabi. Ready for the calorie counts? That plate has 546 calories. 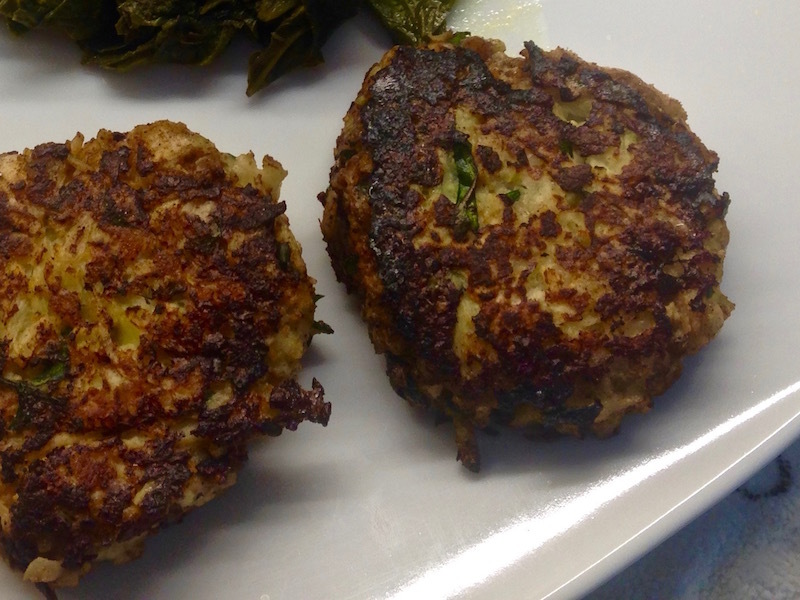 Two kohlrabi cakes are 214 calories. One-third of a roasted kohlrabi bulb is 55 calories. The greens have 96 calories, and the chicken breast has 182. The total fat grams for the whole plate is 30 (almost all of it coming from the butter and oil), and there’s 44 grams of protein. This entry was posted on Wednesday, August 3rd, 2016 at 9:30 pm and is filed under Uncategorized. You can follow any responses to this entry through the RSS 2.0 feed. You can leave a response, or trackback from your own site. Great to see you liked them from the start! If you havent yet, try to make a salad with them grated! Its absolutely juicy and refreshing… after a couple of minutes the salt and the vinegar in your dressing will make them soaked with juice! I usually add one grated apple to two grated Kohlrabi, thats the way we do it in Switzerland! Keep on Strong! Thank you for the great tip! I can’t wait to try that salad.